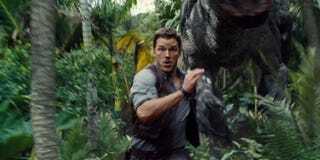 What Could Possibly Happen In Another Jurassic World Movie? In June 2018, Universal is scraping what is left of the amber-preserved DNA to give life to another Jurassic Park movie. Both Chris Pratt and Bryce Dallas Howard will resume their roles in what is technically a sequel to this summer’s Jurassic World. None of this is bad news. It’s not even exactly surprising. It’s just that at this point, we seem to have covered most of the theoretical ground in Isla Nublar. So what could even happen in a fifth movie? Let’s explore a few possibilities. A courtroom drama where they’re deciding the class-action lawsuit that resulted after the catastrophe that happened in the last movie. The same plot as Shrek, but with dinosaurs. Instead of bringing back dead dinosaurs or making new dinosaurs, Jurassic World scientists bring back all of the humans killed by dinos in the first four movies. A scenario in which all the dinosaurs have been replaced by the dogs from the Air Bud franchise. Hijinks ensue. The exact same plot as Jurassic World, except recut as a horror movie. The same plot as Danny Boyle’s The Beach, but it happens on Jurassic Park. Litigation. Lots and lots of litigation.